Michael Johnston used his three years of experience interning with the BIOS Bermuda Program as a springboard for his undergraduate degree, post-graduate studies, and his first publication in a professional scientific journal. A former intern with BIOS’s Bermuda Program had his research on rain and flooding events in Bermuda selected last month for publication in a British meteorology journal. Michael Johnston’s paper appeared online January 18 with the Royal Meteorological Society, a professional group focused on weather and climate. The final inspiration came when record rains fell on the island in January 2017. “This was the perfect case study to tie up a story that was started in my internship,” he said. 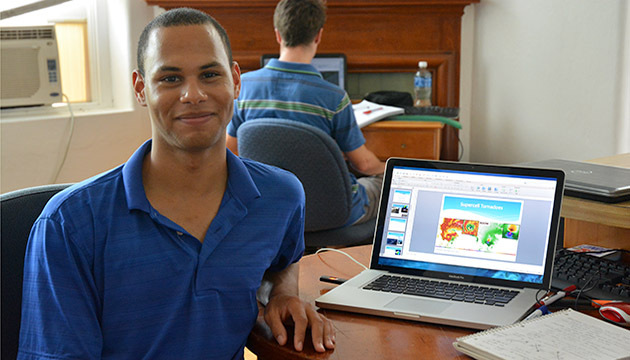 Johnston, now 23, spent three summers conducting research as a Bermuda Program intern under the guidance of Mark Guishard, a former meteorologist with the Bermuda Weather Service and now BIOS’s director of corporate and community relations. The Bermuda Program internship pairs senior school and university students with BIOS scientists for paid, hands-on summer research experiences. Johnston’s science teacher at Saltus Grammar School first introduced him to BIOS’s student programs. His experiences at BIOS guided his university preparations and focused his coursework on relevant subjects such as chemistry, physics, and math. Guishard recalled Johnston’s passion for meteorology after meeting him as a high school student. “He was really into it, and even had his own weather station at home. He put some of my own forecasters to shame,” Guishard said. In 2013 Guishard helped Johnston train to become a meteorological technician (weather observer) through a collaboration between the Bermuda Program and the Bermuda Weather Service. Johnston is currently at the University of Reading in the U.K. conducting graduate level meteorology research on convective cloud systems over islands, and contributes monthly blog posts for BIOS’s Risk Prediction Initiative program.